It's Issa Rae's time to shine in Hollywood, and she knows it just as much as we do. The Insecure star is making waves both on screen and off, and now we get to see more of her talents in Fox's upcoming romantic comedy, American Princess. According to The Hollywood Reporter, Rae will play an American woman who "moves to London, where she's drawn into a world of wealth and high society and falls in love in a very unexpected way." Stella Meghie is set to direct the film while Bridesmaids' Paul Feig, The Heat's Jessie Henderson, and The House's Brendan O'Brien will produce. 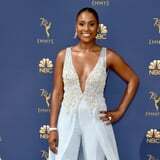 The script, which was originally written by O'Brien, is also undergoing a rewrite by Amy Aniobi, who has worked as a writer and co-executive producer on Insecure. Rae's authentic humor, flair, and developing foothold in the romance and comedy realms of Hollywood make her a great choice for the lead in a rom-com, and we're going to be shaking from anticipation until they announce the release date. Until then, you can catch Rae costarring alongside Amandla Stenberg in The Hate U Give.